To promote “night lighting” tours and to reverse the 20 per cent drop in visitors, the Cambodian government has installed artificial lighting in the 11th century-old Angkor Wat Temple. This project is opposed by some heritage conservationists and concerned Cambodian citizens. 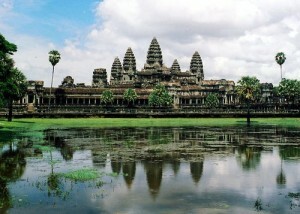 Angkor Wat is the most popular tourist site in Cambodia and is recognized as a World Heritage site. Heritage conservation specialists describe the installed light bulbs as “unsightly.” Since 2006, more than $12 million were spent for the lighting of the temple. It is part of a grand project to transform the Angkor Wat as a complex of entertainment venues. The government defended the lighting decoration by arguing that it has the support of the UNESCO. Authorities also added that only solar powered lighting technology was used in the project. The controversy became more intense when the person who exposed the Angkor Wat lighting was sued by a government lawyer for spreading false information. The accused has fled to France to avoid prosecution. Can this equipped light attract more tourists to Angkor Wat and Cambodia as a whole while a leader of a country is incompetent to lead a country with transparency, security, stability, human right respect, and yet committing corruption and dependent on alm and submitting to neigboring countries? Personally, the light decoration is untolerable and I think those who allow this project to be carried out is considered as a traitor and are untolerable. Those people must think about the long term and should have done their best to preserve this most wonderful work of our greatest ancestors who have built this marvelous heritage for the world, for us and has become the soul, the spirit, and the pride of our people and nation. I kind of like the idea of seeing Angkor Wat at night. I imagine some of the statues, carvings, and shadows would be pretty amazing, particularly after happy hour. And hopefully they'd use really environmentally-friendly lighting, like LED lights, in a smart and innovative way, creating lots of trippy, dramatic angles. But I'd also hope they left most of the park undisturbed, all the better to retain its unique position at the nexus of natural and supernatural. The move may serve to boost falling tourism numbers, but does nothing to address what heritage specialists have been saying for years – that the effects of increased traffic to Angkor is ultimately bad for business. Even from a plain, regular guy like me, I could see that the lighting was absolutely inappropriate for a sacred monument any where in the whole world, let alone a magnificent heritage like Angkor Wat. Who ever came up with that idea should be fired from his job!!!! No sense of fine aesthetic, whatsoever!!! The Deputy PM will be summoned by the Parliament to answer questions about the controversial project. I saw the lighting when they just started it. Was not impressed in the least. Something different, for sure, but it made the temple look a bit creepy. Not to mention during the day when the light bulbs are visible, they look out of place and took away that ancient feeling of the temple.